David Sapienza has never left Turkey Derby at Wall Stadium Speedway with much to write home about. No matter what he did, nothing went his way. He’s had great cars, led races but when it came down to finishes, they just weren’t there. Then came the 2018 edition. 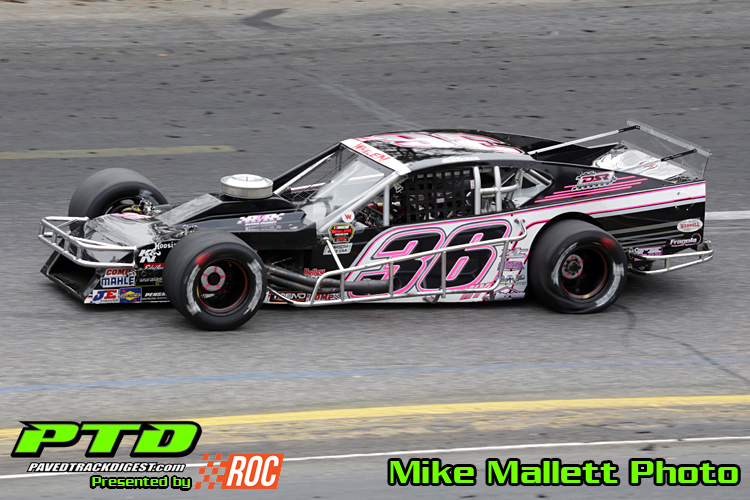 The Riverhead, N.Y., native had one of the best cars in the field on Saturday afternoon. He ran third for most of the race behind Matt Hirschman and Jimmy Blewett. That was until the pair came together. Hirschman spun and Blewett was put back. Sapienza inherited the lead and kept it for the rest of the race for his first triumph in the event. Sapienza went off from the seventh spot for the start of the 150-lap race. He was in the top five by lap 20. By halfway he was into third waiting for an opportunity. He was patient the entire way. His opening came on lap 118. Contact between the leaders worked out in his favor with him inheriting the lead. He didn’t quite get out unscathed as the left year quarter panel was dented, but he gladly traded that for the win. Like Sapienza, Zane Zeiner has a career best in the Turkey Derby finishing in second. It didn’t seem to start off that great as the engine was breaking up in time trials. He managed to put up a good lap that placed him third for the start. He hung at the front all day before finishing second. “We’ll take it,” commented Zeiner. “The way time trials started out, we had a bad miss, luckily it cleared up and we timed third with a little motor. We hung around in the top five most of the whole day and bided our time and came home second. My main goal for this weekend was to just get qualified and then a top five would be a win for us. To be sniffing that close to win is even better for us. Ron Frees’ started out with a poor qualifying lap that found him running the consolation race in order to make Saturday’s Turkey Derby Tour Modified main-event. Frees went out and won the consolation. From there he was impressive all day long finishing up the day in third. “This is great,” commented the driver of the Yaccarino Motorsports No. 43. “This is two years in a row finishing third. We finished fourth the year before that. Turkey Derby, the tour race, has been good to us the last three years. The day was so disappointing in time trials. I was really looking forward a 12.1 or 12.0 but we went out did a 12.5. The car was just terrible. I knew it was going to race good, but we had to run the consi. Thank God we won that and got in feature. It worked out pretty well. “I was just taking my time coming from 19th, picking them off one at a time. I was waiting for the pit stop. I knew after the pit stop that we had our better tires coming. I went for after that. It was pretty good.